The scope of products: Children's bedroom, nursery, library,or the living room and so on. the products' images and the material objects, please refer to the material objects. 2 IN 1 - Perfectly sized sofa bed for kids. Fold-out bottom piece 2 in 1 Flip Open Kids sofa bed, gives childrens the option of lying down flat. Give children to read, play, or folded into a reclining chair and take a nap to provide a more comfortable place. HIGH-DENSITY SPONGE - The kids sofa using a more durable polypropylene foam frame, overall frame design,more sturdy and urable. Higher density and hardness is very suitable for children. The kids sofa 'arms' has a good support,Don't worry about rolling to the floor. DURABLE AND NON-FADING - Peach polyeste permeability is good,soft and breathable, more durable than ordinary cotton.Removable and washable outer cover,you can keep the sofas clean at all times. 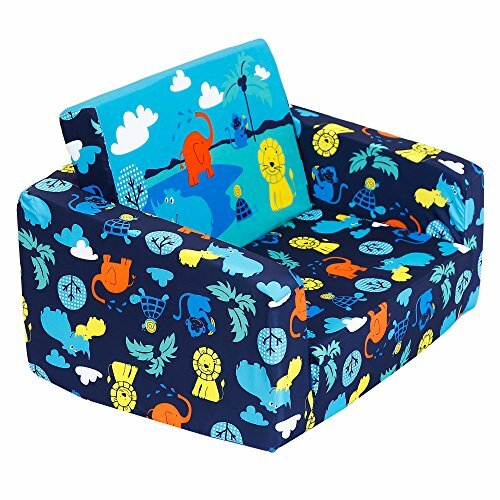 The kids sofa using electric engraving printing,cleaning is not easy to deformation and fade. SAFETY ZIPPERS - This kids sofa design is more secure, the fitted with safety locking zippers to prevent accidental opening by children, use a paper clip to open and closethe zipper slider. Don't forget to remove the paper clip once you have finished. If you have any questions about this product by MallBest, contact us by completing and submitting the form below. If you are looking for a specif part number, please include it with your message.